Saxon Warrior heads a field of 12 declared for tomorrow's Dubai Duty Free Irish Derby at the Curragh. 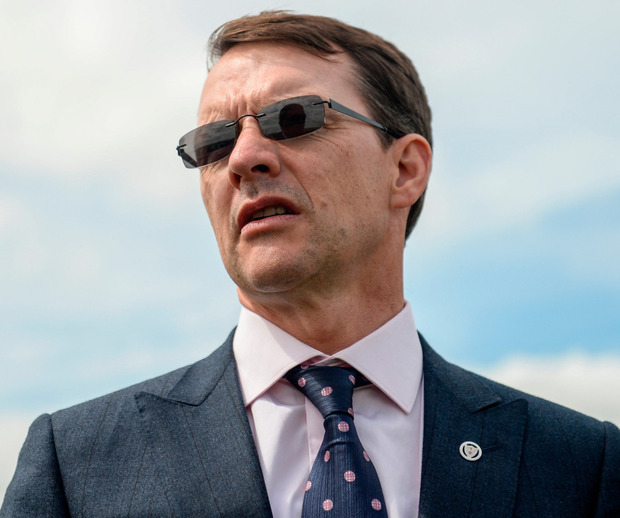 The brilliant winner of the English 2,000 Guineas is one of four runners from the Aidan O'Brien stable as he bids to put behind him a first career defeat in the Investec Derby. Saxon Warrior struggled to handle Epsom's twists and turns and was only fourth to Masar. O'Brien has also declared Delano Roosevelt, Rostropovich and The Pentagon as he seeks to win the Classic for a 13th time. He withdrew his other two entries, Kew Gardens and Nelson, at the 48-hour final declaration stage. Dee Ex Bee, runner-up at Epsom, will try to go one better for trainer Mark Johnston. Masar's trainer Charlie Appleby is represented by Old Persian, which was supplemented for the race on the back of his win in the King Edward VII Stakes at Royal Ascot. A third hopeful from the UK is Harry Dunlop's Lingfield Derby Trial scorer Knight To Behold, which has to bounce back from a disappointing run at Epsom. Frankie Dettori has been booked for the ride. Joseph O'Brien runs Latrobe as he attempts to break his father's stranglehold on the Irish Classic. Three-times winning trainer Dermot Weld saddles the unbeaten Bandua, while Michael Halford's Platinum Warrior, Fozzy Stack's Carlo Biraghi and the Jim Bolger-trained Theobald complete the line-up. Weld, meanwhile, has identified the Meld Stakes at Leopardstown as the likely next port of call for Hazapour. The Shamardal colt earned himself a tilt at the Epsom Derby with victory in Leopardstown's Derrinstown Stud Derby Trial last month and was far from disgraced in finishing fifth at Epsom under Dettori. Weld immediately stated his intentions to drop Hazapour in distance and the nine-furlong Meld Stakes is seen as a suitable target ahead of a possible appearance in the Irish Champion Stakes. "There is nothing definite for him, but it's possible he could reappear in the Meld Stakes at Leopardstown on July 19. That's the most likely," Weld said. Meanwhile, Lagostovegas aims to provide all-conquering Willie Mullins with a first victory in the Stobart Rail & Civils Northumberland Plate at Newcastle tomorrow. The high-class dual-purpose mare is sent back into battle just 11 days after securing Mullins a fourth Ascot Stakes success, where she travelled strongly and won with something to spare. The fact that she lines up at Gosforth Park with only a 6lb penalty was clearly too tempting for Mullins to refuse, with the handicapper likely to take more drastic action once given the chance. Lagostovegas was no match for Withhold when having to settle for third in last season's Cesarewitch, but she is better off at the weights for the rematch.